HOUSTON – AZA has been ranked among the 10 best-performing law firms in the nation in a study of more than 1,100 law firms active in Inter Partes Review (IPR) patent cases over the past five years. The analysis was conducted by Patexia Inc., a global community of intellectual property professionals. Patexia used federal databases to analyze all IPR cases filed from July 1, 2013, through June 30, 2018, to produce its 2018 IPR Intelligence Report. The study assessed more than 7,000 cases involving over 4,700 patents and more than 5,000 lawyers. “IPRs are a fact of life in patent litigation. At AZA, our team has consistently been winning important IPR battles, just as we have been winning jury trials. I’m pleased that the team is getting the recognition it deserves,” said partner Demetrios Anaipakos, who with firm partner Amir Alavi, heads the firm’s patent and intellectual property practice. 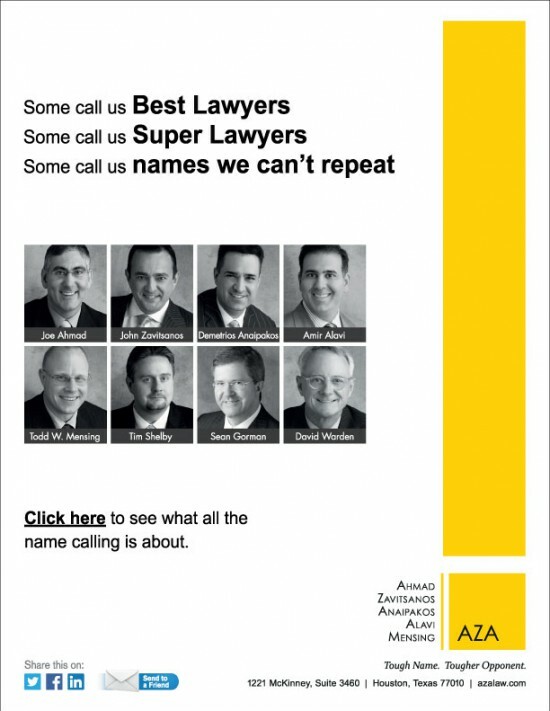 “AZA was ranked the seventh best-performing law firm overall. This is no surprise to our clients who depend on us in many industry sectors including telecom, high tech and energy,” Mr. Alavi said. AZA was also ranked 16th best-performing among firms representing patent owners and 38th most active law firm representing patent owners. Earlier this year, IAM Patent 1000 – The World’s Leading Patent Professionals 2018 also ranked AZA among the best Texas-based patent litigation firms for the fourth year in a row. AZA lawyers have advised clients in IP and IP-related cases throughout the world, including Europe, Asia and the Middle East. The firm’s patent lawyers have experience in numerous industry sectors including energy, technology, chemistry, biochemistry, telecom, hardware and software, and transportation. The firm has had success representing both plaintiffs and defendants in IP cases.